With press trips to Morocco and Liverpool’s Golf Coast coming up, it was a great chance to put Ping’s New G20 irons to the test. The heat of Morocco and its manicured fairways and rough where the ball just sinks to the bottom compared to the Golf Coasts cooler, more windy conditions with its tightly cropped fairways and whispery rough, I felt would make an interesting comparison. Ping have changed the weighting in the head and modified the feel, which I found very impressive. I normally play blades because of the response I get when I hit a ball. Normally when I test cast clubs you can’t feel the impact, but with the new G20s you can feel the strike but you don’t lose any of Ping’s impressive forgiveness. 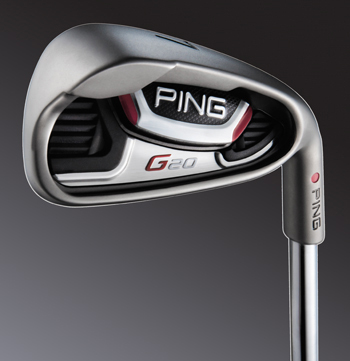 The G20s have a lighter finish than Ping’s K15 and the head itself is slightly more compact to look down on. It still retains the thick top line which helps inspire confidence. You really feel you can’t help but hit a great shot. The G20s sit perfectly at set up no matter what the turf, I felt they gave an air of confidence on both the lush turf of Al Maaden and Mogador in Morocco and the tightly cropped fairways of Royal Birkdale and Formby. You do get a high ball flight, this is due to the wider sole and low centre of gravity. I found myself playing more punch shots on Liverpool’s Golf Coast, but I was still able to obtain a penetrating ball flight when doing so. Visually they are very neat, tidy and have a beautiful finish. 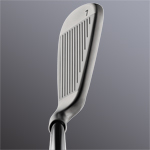 The tuning port and the neck design allow for a vast array of custom fitting options which is great news for the better golfers who want to be fitted for stronger lofts, which help to produce a high penetrating ball flight. One of the weakest parts of my game is chipping especially from about 40 yards in, but I really enjoyed using both the wedge and sand wedge, the way they sit at address and the wide sole inspired a lot of confidence and I have no doubt that these two clubs helped me win the media cup in Morocco. manufacturers grips but it performed perfectly. A great improvement on Ping’s ultra popular G15s, no matter what your handicap you will find a benefit from Ping’s G20 irons. From good players looking for more consistency, feel and a higher more penetrating ball flight, to the beginner who is looking for a club that offers plenty of forgiveness and that inspires confidence at address. Forgiveness and accuracy are achieved through extreme perimeter weighting, a multi-material cavity badge made of soft elastomer improves feel and sound while enhancing distance control. 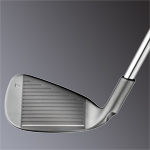 Consistent, precise distance control is achieved by utilising a thinner face design backed by a floating CTP structure. The weight in the back flange of this deeply cut, multi-cavity head design, helps increase the MOI. 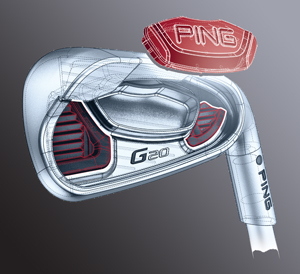 Combined with Ping’s new CFS steel shaft, I found the G20 gives you greater feel and achieves a higher penetrating ball flight.